here is a pic of my track, i actually liked the way it came up but be brutal. hope i can get this pic right. 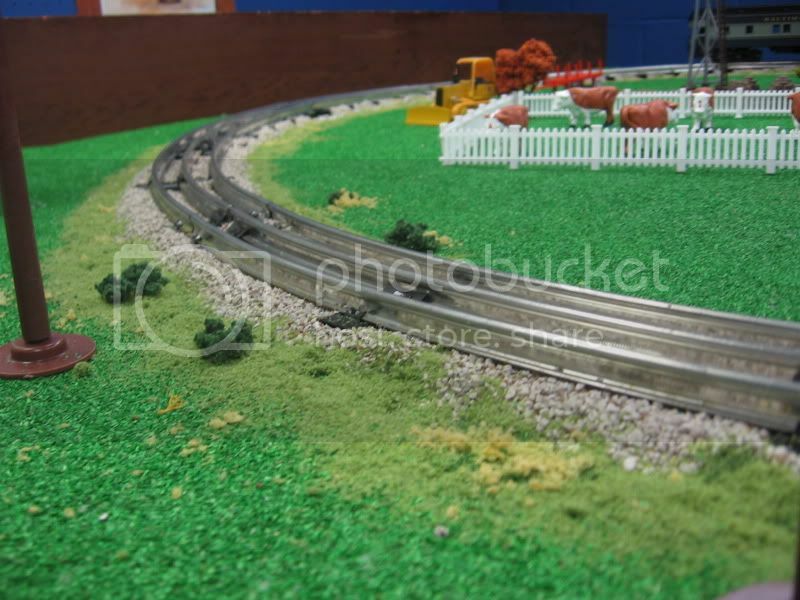 It is a very nicely scenicked and ballasted curve on your layout. Great work. Oh, do you mean what type of curve track section it is? I'd guess that it's a Lionel O gauge (high rail) curve section with 31" outer diameter. If you have 4 curve sections in a row, all turning the same direction, you should have a half-circle. Measure the length across the outside of the widest part of the half-circle (aka semi-circle) and let us know. oh. i thought it was 072 curve but when i saw a pic of that it looked wider than mine but i swear thats what the guy said at the hobby shop. was not the main guy was a younger guy their. he probally made a mistake. Don, your layout is looking good! A cheap way of improving tinplate track is to insert additional ties. These ties can be made from lattice wood (available in Lowe's or Home Depot); or 'Popsicle sticks' available from craft stores like Hobby Lobby. The wood pieces are cut to the same width and length as your metal ties. After cutting (and some minor sanding) stain each of them with a dark - almost black - furniture stain. You will be amazed at how good tinplate track can look...and it doesn't change or harm the original track in any way. Like I said before; I like what you have done. How about some more pictures of the rest of the layout? hi Ray, how do i get the ties on the track. do i have to rip up the ballast. thanks. all i have on the layout right now is the track and a plasticville farm and some animals. going to do a lot this weekend. so will see if i can get it all done. i think the hardest will be the pond and hooking up the swingset and crossing gate. the other stuff is just put it in and done. Good morning Don. Adding additional ties is very easy. After you have prepped the ties (cut to size, coarse sanding, staining...don't worry about neatness as they are railroad ties), you simply slide them under the track - keeping them at roughly the same distance apart. Since the ties are not touched, they should remain in place on their own. If you feel the need, you could use some white glue to secure them semi-permanently. Hobby Lobby sells some Popsicle sticks in various widths - so you can purchase a bag that best approximates the width you need. I suspect you will still need to cut the sticks to length. I checked at Lowe's and you can by a small can of Minwax satin stain for a few bucks...one can should do your whole layout. Do keep in mind that you want a very dark (almost black) stain to almost match the metal ties the track came with. I see, by your use of Plasticville structures, you are keeping with the traditional theme...that is great! Bachmann owns Plasticville; so the selection is large and some pieces of long-discontinued items are available again. Hmmm, I don't see a train depot on your list of structures...something you may want to correct - rather than have your passengers walk through the weeds. Regarding the pond: there are several methods to construct water features on a model layout. Some of these require the mixing of chemicals and others do not. Since you are keeping the traditional theme, you might want to use some wavy, translucent plastic for your water surface. If you are interested in this procedure, contact me off line and I will explain the process further. thanks Ray, 2 questions. you said just slide the ties under the track but my track in sealed with the ballast. do i have to rip it up. if so i think i will just wait for the next layout to do that. 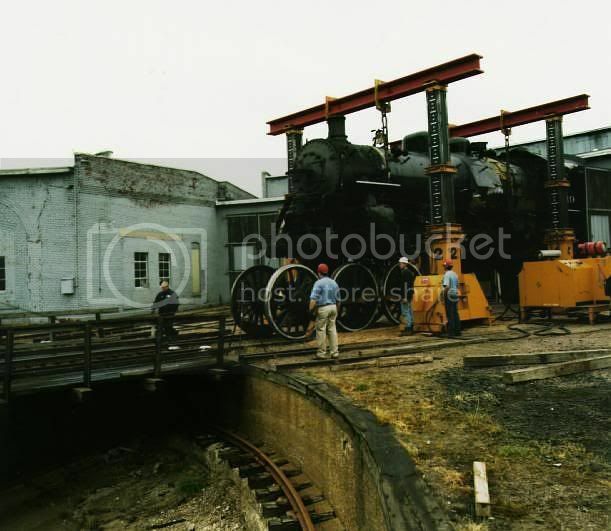 2nd question is the train depot. i figured my layout was a farm out in the country so it would be just a passing train. i actually worked about 4 hours on it last night. i really dont have much left to do. i should be done by thursday. Hey Don, I just came in from doing some exterior painting and saw your post...good time to take a break. Regarding the additional ties: I think you could take a medium blade screwdriver (that is a straight blade) and dig out enough ballast to slide in your additional ties. If you do it carefully enough, you probably won't notice any ballast disturbance. If you do remove more ballast than you planned; just put down some additional ballast and use the alcohol + white glue (or matte medium) to secure it. Ah ha!! You are right in that you mentioned your layout was passing through farm country...not necessarily stopping. I guess I missed that the first go around.